Gold Plated Traditional Pink Ruby Royal Bridal Set For Indian Women Bridal Jewellery. One Neckfit Necklace One Long Necklace One Pair Of Earrings One Tikka One Bajuband One Nosering One Pair Of Hathpanja. 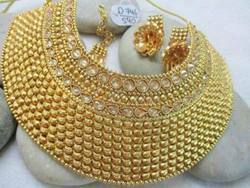 Gold Plated Traditional Bridal Set For Indian Women Bridal Jewellery. One Kundan Neckfit Necklace, One Long Necklace, One Pair Of Earrings, One Tikka, One Bajuband One Nosering One Pair Of Hathpanja. Gold Plated Traditional Pink Ruby Royal Bridal Set For Indian Women Bridal Jewellery. One Neckfit Necklace One Long Necklace One Pair Of Earrings One Matha Patti One Bajuband One Nosering One Pair Of Hathpanja. Wholesale costume will be get discount. Our organization is counted amongst the most distinguished manufacturers, suppliers, wholesalers and exporters of excellent qualityGold Plated Traditional Multi-color Royal Bridal Set For Indian Women Bridal Jewellery. 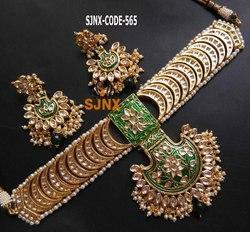 Gold Plated Design Traditional & Antique Design Necklace Set with Earings Indian Jewellery. party wear necklace,Excellent finish.